Most Valuable Player, American League, 1927, 1936; National Baseball Hall of Fame, 1939. One of baseball's greatest hitters, Lou Gehrig (1903-1941) was a teammate of Babe Ruth on the New York Yankees and drove in more runs in his productive 17-year career than all but two other men in history. But Gehrig is known primarily for having played in 2,130 consecutive games and for the crippling disease named after him. Nicknamed the "Iron Horse," Gehrig never missed a single game as the Yankees first baseman from June 1925 through April 1939. During that time he was a fearsome hitter and prolific run-producer, with a combination of batting average and power that rivaled Ruth's. Struck down in his 30s by the crippling muscle disorder, amyotrophic lateral sclerosis (ALS), Gehrig was immortalized for his emotional farewell speech at Yankee Stadium on July 4, 1939, when he said he was "the luckiest man on the face of the earth." Lou Gehrig was born in New York City on June 19, 1903. His parents, Christina Fack and Heinrich Gehrig, were German immigrants who lived in the lower-middle-class section of Manhattan's Yorkville neighborhood in the early 1900s. Henry Louis (Heinrich Ludwig), the second of four children, was the only one who survived infancy. He weighed an astounding 14 pounds at birth and grew quickly into a strong boy. The Gehrig family was poor. Heinrich Gehrig was an art-metal mechanic who worked sporadically due to drinking and ill health. Christina Gehrig took jobs as a maid, launderer, cook, and baker. From a young age, Henry helped his mother deliver laundry. He developed a close, lifelong attachment to her. Gehrig's father took him to gymnasiums to work on building up his muscles. Henry Louis was a remarkable young athlete. At age 11, he swam across the Hudson River. At his mother's insistence, Gehrig went to Manhattan's High School of Commerce. But he spent as much time working as studying. When he was 16, he got a summer job with the Otis Elevator Company in Yonkers, New York, and was the company team's left-handed pitcher. Soon after that, he earned his first money at baseball, $5 a game, pitching and catching for the semipro Minqua Baseball Club. Gehrig gained fame in 1920 when his Commerce High School team, representing New York, played in Wrigley Field against Chicago's best high school team. Gehrig hit a ninth-inning grand slam to ice a victory and garner headlines in New York. Columbia University recruited Gehrig on a football scholarship. Before enrolling in 1921, Gehrig tried out for legendary New York Giants manager John McGraw, who reprimanded him for missing a ground ball at first base and sent him to the Class A Hartford team, where he played 12 games. Gehrig didn't know that the professional play violated collegiate rules. He was banned from Columbia sports for a year. Playing one season of baseball at scruffy South Field, he hit long home runs off the steps of the Low Library and the walls of the journalism building, while others landed on Broadway. He pitched, played first base and outfield, and hit .444. Paul Krichell, a New York Yankees scout, signed him to a contract. Gehrig arrived at Yankee Stadium via subway, carrying his spikes and gloves in a newspaper. He made an immediate impact by clouting long homers during batting practice. But he was returned to Hartford and played there for most of 1923 and 1924, appearing in only 23 games with the Yankees in those two seasons. Gehrig stuck with the Yankees in 1925. On June 1, he pinch-hit for shortstop Pee Wee Wanninger. On May 6, Wanninger had replaced Everett Scott in the lineup, ending Scott's record streak of 1,307 consecutive games played. On June 2, a batting-practice pitcher from Princeton hit first baseman, Wally Pipp, before the game. Pipp went to the hospital with a concussion and Gehrig replaced him in the lineup. Pipp never returned to his first-base job, and Gehrig went on to shatter Scott's mark by 803 games. Gehrig batted fourth in the lineup, behind Ruth, and had a great career that was overshadowed by Ruth's fame and achievements. By the time Gehrig broke in, Ruth was already the nation's biggest sports star. Ruth was a flamboyant character with a voracious appetite for publicity, food, drink, and women. Gehrig, in contrast, was quiet and called little attention to himself. He was a team player, dedicated to winning and unimpressed by personal achievements. 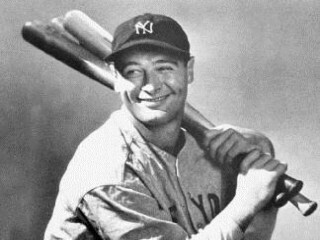 Ruth's frequent holdouts for higher salaries bothered Gehrig, to whom "the game was almost holy, a religion," according to sportswriter Stanley Frank. Sportswriter Marshall Hunt described Gehrig as being "unspoiled, without the remotest hint of ego, vanity or conceit." With his Boy Scout aura, Gehrig inspired writers to describe him as a paragon of virtue in contrast to Ruth. In fact, Gehrig was not that pure. He loved practical jokes and slapstick and sometimes crushed straw boaters on people's heads. Once, in a wacky effort to "break a slump," he urinated over the terrace of a friend's West End apartment. In the bulky uniforms of those days, the thick-thighed Gehrig looked unathletic and soon acquired the nickname "Biscuit Legs." His fielding around first base was clumsy at first, but he worked hard to improve it. Sportswriter Frank Graham dubbed him "The Quiet Hero." His consecutive game streak eventually earned him the nickname "Iron Horse." Gehrig was a key member of the 1927 Yankees, considered by many to be the greatest team of all time. That year, Ruth hit 60 home runs, which stood as the record until 1961. Gehrig hit 47, added a league-leading 52 doubles and 18 triples and led baseball with 175 runs batted in. The two were the heart of a lineup so powerful it was nicknamed "Murderer's Row." They led the Yankees to three World Series appearances from 1926 through 1928. In the 1928 series, Gehrig hit four home runs in the Yanks' four-game sweep and hit .545. The team failed to win the next three years, but not for lack of production from Gehrig and Ruth. From 1929 through 1931, the two sluggers combined for 263 homers. Gehrig led the league with 174 RBIs in 1930 and 184 RBIs in 1931, which set the American League single-season record. The uncomplaining Gehrig never made more than a third of Ruth's salary. It seemed something was always eclipsing him. Even Gehrig's four-homer game at Shibe Park in Philadelphia in June 1932 was overshadowed by the retirement of legendary Giants manager McGraw that same day. Gehrig's two homers in a 1932 World Series game in Chicago were forgotten in the legend of Ruth's mythic "called shot" homer the same day. Remarkably little attention was paid to Gehrig's consecutive-games streak as it progressed year after year. In 1933, Gehrig surpassed Scott's record. He continued to play despite broken fingers, back pain, and sore muscles. Nothing could keep him out of the lineup. On September 29, 1933, he married a Chicago woman named Eleanor Grace Twitchell in the morning, then was rushed by motorcade to Yankee Stadium for an afternoon game. In 1934, Gehrig won the league's Triple Crown, a rare feat, with a .363 batting average, 49 homers and 165 RBIs. Even then, he was not named the league's Most Valuable Player; Mickey Cochrane of the Tigers took that honor, with far inferior statistics. That year was Ruth's last with the Yankees. One day that season, Gehrig was hit during an exhibition game and suffered a concussion. But he played one inning the following day to keep his streak intact. A few weeks later, he couldn't straighten up, said he had a "cold in his back," and left one game after the first inning. Gehrig would suffer similar bizarre attacks over the next few seasons, seemingly harbingers of his fatal disease. Gehrig played one season without Ruth before a new superstar, Joe DiMaggio, joined the Yankees. Again, the dependable Gehrig was left in the shadows. The Yankees returned to the World Series in 1936, 1937, and 1938. Gehrig turned the tide in 1936 with a key home run against ace pitcher Carl Hubbell of the New York Giants. He finished with a lifetime .361 Series average in 34 games and ranked in the Top Ten all-time in almost every Series hitting category. By 1938, Gehrig was in a noticeable decline. His average of .295 was the lowest since 1925. Over the winter, he fell several times while ice skating. During spring training in 1939, his swings were weak; sometimes he had trouble getting up from a sitting position. Yet when the season started, manager Joe McCarthy continued to play Gehrig, to keep the streak alive. A sportswriter observed that Gehrig looked "like a man trying to lift heavy trunks into a truck." When the Yankees arrived in Detroit for a May 2 game, Gehrig was hitting .143. He took himself out of the lineup, telling McCarthy it was "for the good of the team." Gehrig took the lineup card to home plate with Babe Dahlgren's name at first base. The Detroit fans applauded for two minutes. Gehrig tipped his cap and disappeared into the dugout and the record books. He would never play another game. His streak of 2,130 games was a record that would stand for 56 years. He finished with 493 home runs, 535 doubles, 162 triples, a .340 batting average and 1,990 RBIs, third-highest among all major leaguers. A month later, Gehrig entered the Mayo Clinic and was diagnosed with ALS, a degenerative muscle disorder first described in the late 1800s by a French physician. Gehrig remained with the team, sitting on the bench. He professed awe at having a fan's perspective on his beloved game. "I never appreciated some of the fellows I've been playing with for years," he said. "What I always thought were routine plays when I was in the lineup are really thrilling when you see 'em from off the field." On July 4, 1939, the Yankees staged a Gehrig Appreciation Day at Yankee Stadium. Ruth and other members of Murderer's Row returned for the ceremony, along with Yankee officials and dignitaries. At first, Gehrig was too overwhelmed to speak, but the crowd chanted: "We want Gehrig!" He stepped to the microphone, blowing his nose and rubbing his eyes. Cap in hand, he spoke: "Fans, for the past two weeks you have been reading about a bad break I got. Yet today I consider myself the luckiest man on the face of the earth. I have been in ballparks for 17 years and have never received anything but kindness and encouragement from you fans. Look at these grand men. Which of you wouldn't consider it the highlight of his career just to associate with them for even one day? ... "When you have a father and mother who work all their lives so that you can have an education and build your body, it's a blessing. When you have a wife who has been a tower of strength and shown more courage than you dreamed existed, that's the finest I know. So I close in saying that I might have had a bad break, but I have an awful lot to live for. Thank you." In December 1939, the Baseball Writers Association waived their usual five-year waiting period and unanimously elected Gehrig to the Baseball Hall of Fame. Gehrig then took a job with the New York City Parole Commission. He rarely visited Yankee Stadium because it was too painful to see the game he missed so much. Gehrig died on June 2, 1941 in New York City, exactly 16 years after he had permanently replaced Pipp in the Yankees lineup. The following year, movie producer Samuel Goldwyn released "Pride of the Yankees," a Gehrig biography with Gary Cooper in the lead role and Babe Ruth appearing as himself. It became one of the most popular baseball movies ever made. Little understood then, ALS became more well-known as Lou Gehrig's disease. Its high-profile victim brought it attention, research, and understanding. The incurable disease strikes about 5,000 Americans each year; most die within two to five years. It is the only major disease named after one of its victims. David Noonan of Sports Illustrated noted the irony that "one of the greatest baseball players who ever lived is best known for the way he died." View the full website biography of Lou Gehrig.